The Certification of Eligibility printed on CSC official letterhead will be issued by September 6, 2018. The certification will be issued through the CSC Regional/Field Offices. CSC reminded all passers that the CoE must be personally claimed by passers. Representatives are not allowed. For the passers who may not claim their certification at the Regional office due to certain circumstance, they may personally claim the CoE at the neares CSC Regional or Field Office upon written request. Claiming of CoE will be 1 month after the issuance of results. Meanwhile, they may coordinate with the nearest Regional/ Field Office to inquire if their CoE is already available. Bring one (1) valid Identification Card to claim. CSC preferred the same ID that the applicant used during filing of application. Please be reminded that CSC Regional/ Field Office may ask for additional documents to further verify the identity of passer. The eligibility exams for professional and subprofessional levels were conducted on June 24, 2018 at designated regional testing locations nationwide. 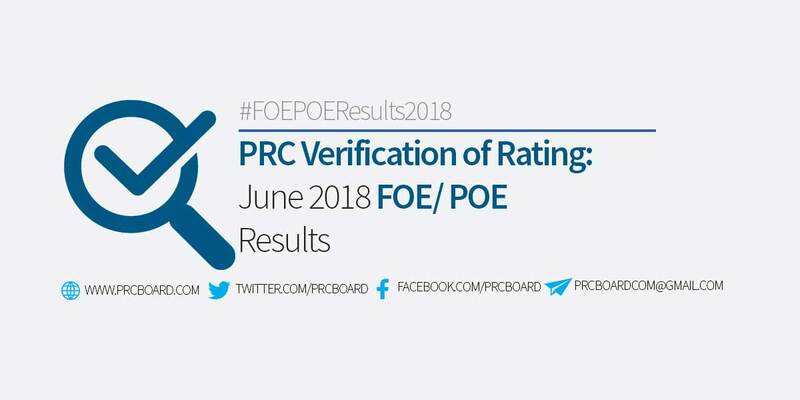 To receive updates on June 2018 Fire Officer Exam and Penology Officer Exas (FOE-POE) result, we advise our visitors to bookmark this page, visit CSC official website or follow us at our social media pages via Facebook and Twitter. mga sir ano po ang next step pag nakapasa ka na sa FOE. my nagsabi sakin na my preliminary exam pa daw. i dont know if its true or not. hope you can help me. thank you and Godless. Hello po paano po Makita ung rating ng exam Sa FOE? Sir i would like to ask. If pued ba maka apply ang may skin tatto sa bfp.?? Pued po ba mg.apply sa bfp ang may skin tattoo.? sir bakit hindi parin amkita ang result ratings? paano po makita ang rating ng exam? Wala pa po bang rating? Wala pa din yung akin. Bakit po hangang ngayon hindi parin ma view ang rating? Palaging examinee number is not found. .
cannot be found ang ratings panu poh makita sir/ma'am? Wala pa po ba rating ng di nkapasa? sir ask lang po... bakit wala pa po ung ratings ng exam? kaylan po kaya un? salamat po? Bakit hindi ko parin ma view yung rating ko sa FOE? September 02 ngayon..
Bakit wala parin yung rating ng hindi nakapasa ng FOE EXAM?